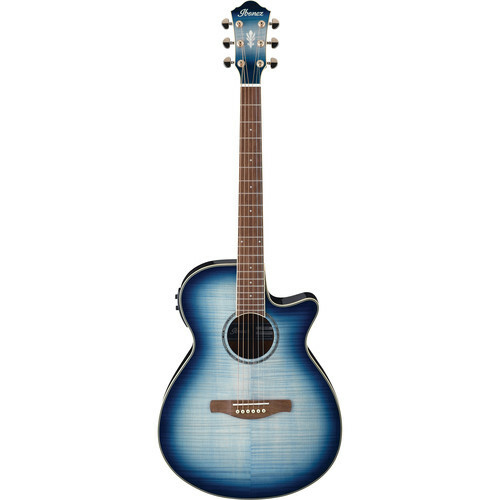 Styled in an indigo blue burst high-gloss finish, the Ibanez AEG20II is a full-sized acoustic/electric guitar with a flamed maple top and sapele back and sides. The neck has been constructed out of nyatoh, features a 25" scale, and offers a 21-fret laurel fingerboard. The instrument has gold die-cast tuners with half-moon knobs, and a laurel bridge secures the strings to the body. The single-cutaway body delivers a powerful and balanced acoustic sound. Unplugged or amplified, the instrument is well suited for solo performance or playing with a full band. For electronics, the AEG20II is equipped with a Fishman Sonicore pickup, as well as an Ibanez AEQ-SP1 preamp, a 3-band EQ, and an onboard tuner. Box Dimensions (LxWxH) 41.3 x 18.0 x 4.8"